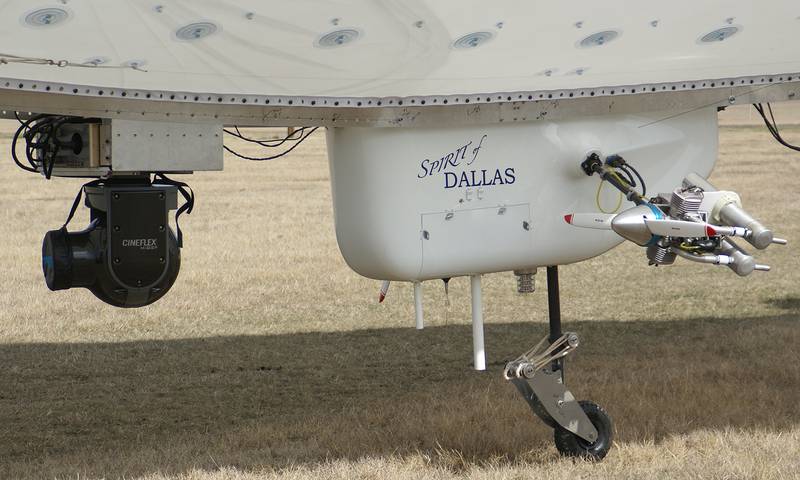 Part One: The path of the spirit… - Galaxy Unmanned Systems L.L.C. The year was 2008, and after almost a decade of escalating research and development two brothers were poised to launch a new platform for delivering high definition broadcast quality imagery utilizing a very old technology. The path to launching this Unmanned Aerial System (UAS) goes back much further than just these two brothers. It actually started back in the days where the first Remote Control (RC) proportional transmitters began to replace the Dean’s reed systems RC transmitters back in the 60s. A man named Ted White looked to make his hobby a profession by contributing not only his RC piloting skills to manufacturers of these new radios, but to help produce them as well. One of his products was the Galaxy 5 radio. 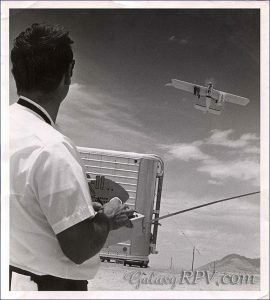 Ted White went on to design aircraft, compete in RC flying competitions and generally exercised his love for RC aircraft by travelling all over the southwest United States wowing crowds at airfields and airshows along the way. It is thought that he was one of the best RC pilots, if not the best pilot of his generation. Regardless, he certainly was to his two boys. Watching their father fly they too became RC pilots and enthusiasts, to nobody’s surprise. They themselves do not recall ever learning how to fly RC aircraft, or that there was ever a time that they didn’t know how to fly them. Tony White, the older of the two, excelled in the craft and fully embraced the sport by mastering every type of RC platform he could get his hands on, while his younger brother Jason White focused on more earthly things such as computers and business development. Fast forward to the new millennium where the two young men decided they too would make their hobby into their livelihood. Together they started their own company, Galaxy RPV, with a business plan centered on only one thing; make and support Remote Piloted Vehicles (RPVs) for any and every industry that could benefit from them. Having flown target aircraft for the military and participating in a few Government projects as an RC test pilot/SME, Tony realized the DOD market was a very tight niched community with very steep barriers to entry and very well connected players. The path of least resistance was thus the civilian market. Tony, being a licensed manned aircraft pilot, had a very good understanding and appreciation for the rules in which aircraft must operate while in the US National Airspace (NAS), and the new company went to great lengths to seek and comply with all full sized aircraft regulation wherever applicable and practicable. Working with local branches of the Federal Aviation Administration (FAA) Galaxy created a lengthy paper trail of authorizations and precedents for operating their aircraft over the US NAS. Galaxy soon found their way into unmanned airships via piloting and designing indoor electric blimps at various sports arenas. While this was initially an avenue to fund some of their more traditional fixed wing and rotary wing outdoor platform initiatives, Galaxy began testing and experimenting with envelopes varying in lengths from 22 feet to 35 feet for outdoor operations. While fixed wing and rotary platforms offered a wide range of options in open air, and were utilized in early operations, Galaxy found the most interest in unmanned airships and saw a path to establishing RC aircraft as reliable and safe platforms in the civilian market. Out of a warehouse in Fort Worth, Texas, between the years of 2000 and 2006, Galaxy RPV began a period of research and development through practical application. Continuing relations with the local FAA offices Galaxy was able to perform numerous jobs around both the Dallas/Fort Worth Metroplex and abroad utilizing their line of unmanned airships for both aerial imagery gathering and advertising. Galaxy RPV soon became Galaxy Blimps and the platforms continued to escalate in both size and utility. 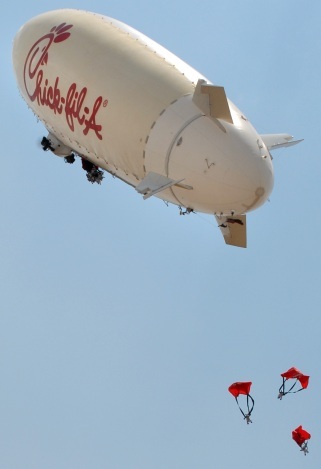 The 30 foot test envelope was refined into a scalable configuration and was followed by numerous 35 foot unmanned airships for various clients and a 40 foot airship for a university in Japan. All of these Lighter-Than-Air (LTA) Unmanned Aerial Systems (UAS) were built with full size blimp regulations in mind and flights were cleared and coordinated through relevant local FAA offices. ll flight trials, demonstrations and turret test flights while integrating into the normal flight pattern at a major municipal airport as a right of way vehicle. Taking lessons learned from this platform Galaxy Blimps set upon the design and construction of the first 75 foot long production model. 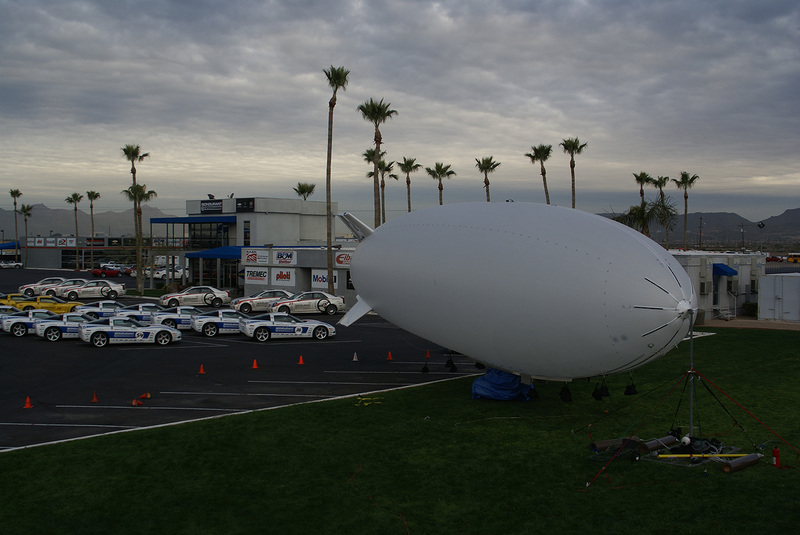 In February of 2008 the prototype 60 foot airship was to be utilized for a proof-of-concept demonstration at a National Hot Rod Association (NHRA) event in Phoenix, AZ for both the NHRA and ESPN2. This event was not only to establish the platform as a reliable live television broadcast platform, but was also laying the foundation for a practical operational business model for the 75 foot production airship. 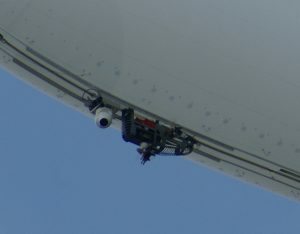 The initial plan called for the unmanned airship to simply supply a wireless feed to the broadcast booth as a demonstration, and was not going to be utilized in the actual broadcast. The Cineflex V14 HD Broadcast turret was selected for the demonstration and Galaxy established a launch and recovery zone out of a small lot off the side of the main drag strip. This is where the article began and the moment the path of two generations has led to. 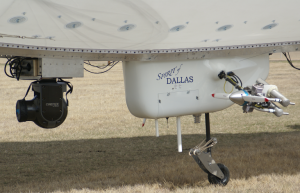 Galaxy UAS represents a body of work in the Unmanned Aerial Systems Industry.